Starring Barry Sullivan, Albert Dekker, Belita, Eugene Pallette, Bonita Granville, George E. Stone, Miguelito Valdés. Here's a treat: a fun noir thriller that almost nobody's heard of. Back in 1945 Monogram pictures had an uncharacteristic smash hit with the edgy (for the time) crime picture Dillinger, produced by the King Brothers Frank and Maurice. Dillinger's screenplay got an Oscar nomination, which put writer Philip Yordan on the fast track to becoming one of the more interesting independent wheeler-dealers of his time. The King Brothers and Yordan were rewarded with an enormous (for Monogram) budget for their next effort, a stylish potboiler about a sleazy hustler who gets more trouble than he bargained for. At first glance Suspense doesn't seem like a particularly good idea: the background for this tale of infidelity and murder is a big ice skating show, and the movie comes to a screeching halt four or five times to present elaborate musical numbers on ice. But some intriguing characters and class-A hardboiled dialogue make an unbeatable combination. Even better, the Warners Archive Collection's disc has a spotless new transfer and restored audio. It's like walking into an air-conditioned theater in the spring of 1946. Suspicious, fast-talking and self-confident drifter Joe Morgan (Barry Sullivan, looking like Robert Ryan's unsavory twin brother) cons his way into a job selling peanuts in the big Ice Show run by Frank Leonard (Albert Dekker). A cold operator, Frank likes Joe's swaggering style and rewards him for coming up with a ballyhoo gimmick for the show. Joe makes fast friends with show manager Harry (likeable Eugene Pallette, in his last movie) but undertakes a dangerous campaign to seduce Roberta Elva (Belita), the show's glamorous star and Frank's wife. Joe makes no excuses for his behavior and Roberta does find him charming, but he also has to contend with Roni (Bonita Granville of the Nancy Drew movies), a discarded girlfriend from Chicago. Offended, Roni investigates Joe's background in New York to discover what made him run to L.A. broke and hungry. Joe decides to make his move on Roberta by showing up at the High Sierra vacation cabin where Frank and Roberta have retreated for a rest. Joe is quite pleased with himself, unaware that Frank knows everything and has serious plans to retaliate ... with violence. Monogram was clearly aiming for a crossover hit by making Suspense a dark mystery with big-scale musical numbers. The casting of Olympic skater and ballerina Belita sounds like an attempt to duplicate the success of Fox's Sonja Henie, but Belita proves herself an all-round talent. She projects a variety of moods without benefit of dialogue; the Roberta Elva character is interesting, intelligent and worth our respect. Her ice-skating is pretty amazing as well, and done with a minimum of production flash -- we can tell that she's a real artist on ice. As added spice, former child actress Bonita Granville plays the Bad Girl from Joe Morgan's past who takes a hotel room across from him and keeps showing up, like Lauren Bacall looking for someone to light her cigarette. Granville is made up like a bad-news version of Betty Grable, and if you're only familiar with her roles as sugary teens and innocent victims of Nazi torture, her image here is quite a surprise. Film noir is great for providing actors with a chance to do something different. Ms. Granville's star never rose higher, but she continued acting in television while doing extremely well as a big-time TV producer. Suspense is unlike other Monogram pictures of its time -- take a look at Decoy to see just how cheap poverty row can get. The director of note is the respected Frank Tuttle (Roman Scandals, This Gun for Hire) and the cinematographer the great Karl Struss (Murnau's Sunrise, Mamoulian's Dr. Jekyll & Mr. Hyde). Frank Paul Sylos' art direction takes its cue from the Art Deco ornamentation on the old Pan Pacific Auditorium and produces a number of sets as good as anything in big studio productions. The Pan-Pacific is a key location in the picture; the film's impressive skating sequences may actually have been filmed on its enormous ice rink. Director Tuttle and the art people give us an impressive number of moody rooms and an alpine cabin that looks like a great place for lovers to be caught in the act. Karl Struss' camerawork, aided by excellent special effects (a matte angle on a High Sierra skating pond is very impressive) lends an air of mystery to the cavernous ice rink and Frank's exotic terrace apartment. A key scene in the basement of the ice rink is lit primarily by one swinging light bulb, a raw visual later praised in anti-Hollywood movies of The New Wave. By the time the double-crosses and nervous suspense scenes take over, we're thoroughly hooked. The conclusion hinges on a dangerous 'ring of death' show prop made of swords -- Roberta Elva leaps through them backwards, at full speed. One of the top swords comes loose just when Joe's convinced that Roberta's going to turn him into the cops. 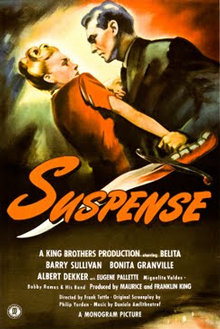 Suspense concludes with a satisfying surprise twist that returns it squarely to noir territory. The King Brothers continued with at least two more classy noirs. Their next thriller The Gangster used Barry Sullivan in a similar role (with Belita, too) as a confident neighborhood mobster who refuses to acknowledge that his turf has been taken over by a rival outfit. After that came the acknowledged classic Gun Crazy. All three delirious, downbeat gems end on the same creepy dramatic note -- utter doom for their overreaching protagonists. As a last note, Suspense has a tiny bit by fave comic Sid Melton, and a nice little scene with a seven year-old Billy Gray, who five years later would star in The Day the Earth Stood Still. Gray is incredibly cute and easy to miss if you don't know who he is beforehand. 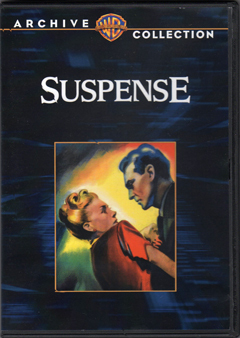 The Warners Archive Collection's DVD-R of Suspense does look indeed like it was filmed yesterday. The image is rock steady, sharp and detailed, and the clear audio emphasizes the orchestration of voices. Deep-voiced Sullivan "harmonizes" well against Albert Dekker's insinuating tenor and Eugene Pallette's gravelly bass. Once again the Archives comes up with a difficult-to-see title; I had a taped-at-2am VHS of this show for about twelve years, until it became unplayable. Before this we couldn't tell if Suspense was well photographed; now we can see that it's perfectly capable of standing beside noirs from the bigger studios. 1. If Suspense and the Rita Hayworth movie Gilda hadn't been released in the exact same month, I'd say somebody copied somebody else's homework. Like Glenn Ford in the Charles Vidor picture, Barry Sullivan works for a mysterious club owner and in his absence takes charge of the owner's wife. The club owner disappears and is thought dead, but returns to exact revenge. Not only that, but both Albert Dekker and George Macready have similar Judas windows in their offices, overlooking their respective club interiors. Ah, Hollywood. 2. For years I misremembered Suspense, thinking that Miguelito Valdéz sang his signature song "Bim Bam Boom" in it. No such luck. "Bim Bam Boom" was sampled and reconfigured into one of the better musical delights in the crude but infinitely creative cult film Forbidden Zone. One listen and it's never forgotten. Unfortunately Valdéz himself is almost forgotten, at least in the United States. Anyone have a lead on a good CD of his top hits? Suspense is the only opportunity I know to see him in action.